A growing concern with vacuums is improved filtration and you will not find a vacuum brand that is more dedicated to high quality filtration than Miele. How does Miele reach the highest standards when it comes to filtration? It is a 3 step filtration process, and we break it down in the following article. Miele AirClean Dustbags: It all starts with the dustbags. That’s right! Forget the bag-less vacuums that let dust and allergens back into the air when you go to empty them. 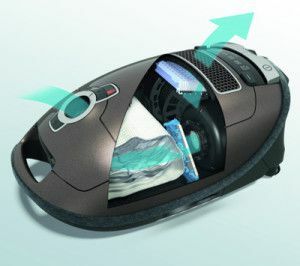 Miele’s AirClean vacuum bags are comprised of 9 layers of electrostatically charged material with an Auto-Seal, self-locking collar that keeps microscopic dust and allergens trapped inside for good. No more messy bag removal! Pre-Motor Filter: The pre-motor filter is pretty simple, but it keeps dirt, sand, pebbles, and other debris that might have escaped the dustbags from damaging the motor. As you can see from the picture above it is on the interior of the vacuum and it is the second step in the filtration process. Air that moves through the dustbag will be pulled through the motor, so it is important to have a clean, working pre-motor filter. A new one of these is included with each box of Miele bags. Exhaust Air Filter: This filter is the last step of the filtration process and helps capture unpleasant odors and harmful allergens before they are dispensed back into the air. Some Miele vacuums come standard with the AirClean filter material, but if you want the best available, Miele’s HEPA air filters are for you! These are a true HEPA filter! Many companies claim to have HEPA filters in their vacuums, but without enough of the filter material present the results may not actually be HEPA certified. Miele’s HEPA filters meet Europe’s stringent HEPA 13 standards, capturing over 99.95% of all particles, down to an amazing 0.1 microns. This upgrade is great for households with kids or pets or individuals that suffer from allergies. Don’t allow the fine dust, pollen, allergens and pet odors that are pulled out of your carpet re-escape into the air inside your home. With a Miele vacuum and certified HEPA filtration you can rest assured that these micro particles and smells are being captured and will not be put back into the air you breathe. Because of Miele’s 3-step filtration process, we guarantee that the air escaping your Miele vacuum is some of the cleanest air in your home! Stop by or give us a call if you have any questions. We are always here for you to answer any questions that you might have!